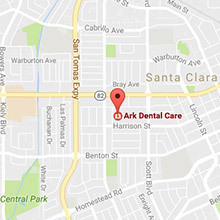 At Ark Dental Care, we provide expert general and cosmetic dentistry services for the entire family. Below are the services we offer. Just click on the services to learn more about each one. 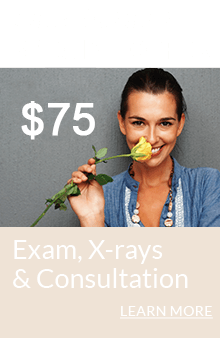 Dr. Khetani conducts a comprehensive new patient exam and uses high-tech digital X-rays and detailed inspections to get an accurate assessment of your oral health. She makes sure to address any areas of concern, explain your treatment options and answer all your questions. Dr. Khetani provides thorough and gentle teeth cleanings using an ultrasonic scaler, and educates you on how to keep your teeth healthy between visits. She can effectively treat mild to moderate gum disease, using minimally invasive treatment methods to restore your oral health. Dr. Khetani provides gentle tooth extractions and makes sure you are comfortable at all times during the procedure. She can also place a bone graft to fill up the tooth socket and preserve its size and shape, making it possible to securely place a bridge or dental implant in the future. Dr. Khetani provides top-quality dental crowns that are precisely crafted to look natural and fit very precisely. She uses only the highest-quality materials, including ultra-strong zirconia porcelain, one of the latest advances in dentistry. Dr. Khetani provides strong, natural-looking and well-fitting porcelain dental bridges that are comfortable and long-lasting. Porcelain veneers are thin porcelain facings that are bonded to the front of teeth and can be used to change their color, shape and size. Dr. Khetani uses high-quality porcelain and takes great care to give you veneers that look totally natural and aesthetic. Using our in-office whitening system, Dr. Khetani can create a dramatic improvement in your smile in as little as one hour. She can also provide you with professional whitening gel and customized bleaching trays so you can whiten your teeth at home. Dr. Khetani provides experienced cosmetic dentistry to improve the appearance of your smile. She uses restorations made out of the finest materials and pays great attention to detail to ensure your results are beautiful, natural-looking and long-lasting. Invisalign uses a series of clear, removable plastic aligners to effectively and comfortably straighten your teeth without metal brackets or wires. Dr. Khetani is a certified Invisalign provider and can give most patients a straight and beautiful smile without the inconvenience or discomfort of traditional braces. A dental implant is a titanium post that is inserted into your jaw and acts as a strong, artificial replacement root for a missing tooth. Dr. Khetani uses implants to support single dental crowns or dental bridges. Implants are the strongest, most lifelike and longest-lasting form of tooth replacement. Dr. Khetani will guide you through the entire procedure in partnership with a trusted local specialist who will place your implants. Dr. Khetani provides natural-looking, well-fitting and comfortable dentures, including flexible, metal-free partial dentures. Using state-of-the-art equipment, Dr. Khetani can gently and effectively perform full root canal therapy in one visit for most patients. Dr. Khetani is experienced in providing dental services for children and always ensures they are comfortable during treatment. We accept dental emergencies, and you should not hesitate to call us if you have one. We will do everything possible to get you seen the same day. If you call us after hours, our voice message will give you instructions on how to reach the Dr. Khetani directly.